All I can say is Yay Yay Yay..! 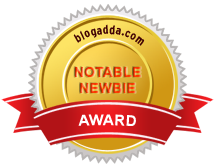 *YOU yes, YOU for being a part of my blog, for making this possible...if it were not for your support and love, I would have quit blogging long ago! *Indiblogger.... If there's any reason I enjoy blogging and would never dream of quitting it, it's Indiblogger! *My lovely sisters Zooni and Najm. They ere the ones who introiduced me to blogging... Love you both! *My friends, Megha, Heena, Nitesh, Ritesh, Harsha, Ashish... your comments never fail to spread a BIG smile on my face! To celebrate this day I have already kept two giveaways out of which one is already over and one - a BIG one is still going on! So don't miss it my cupcakes! ....and should I add that I am so freaking happy today that I have decided to part from a large number of my treasures?! (Irony baby!) Haha...yes friends! On the 27th, I'll be holding a BIG BLOG SALE where I will be selling off everything pretty which belongs to my *don't use just collection* at half price! Say Yayeeee! Hey Bushra Many Many Happy Returns of the day to your blog... :D,Main dua karta hu ki tumhari blog jiye infinite years... :D.
Congrats. Great going. Wish you greater going ahead. [ Smiles ] Happy first blogoversary, Bushra! Happy Blogoversary Bushra and Merry Christmas. Congrats Bushra! Wish u many more anniversaries! Bushra, Many Many happy returns for your blog's anniversary. You have indeed created a niche in blogging in just twelve months. May you and your blog prosper and we hope to see lot's more of creativity and shayaris from the great shayara. Keep Blogging & hosting such awesome giveaways! =D7 Congratulationsss... Bushra on your blogoversary. Kudos for keep it going. Thanx Bush. Loved all the prizes. Happy happy dance!!! !